With constant payout ratio, a firm pays a constant percentage of net as dividend to the shareholders. In other words, a stable dividend payout ratio implies percentage of earnings paid out each year is fixed. Accordingly, dividends would fluctuate with earnings and are likely to be highly volatile in the wake of wide fluctuations earnings of the company. 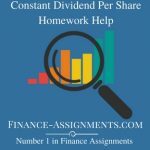 As a result, when the earnings of a firm decline substantially or a loss in a given period, the dividends, according to the target payout ratio, would be low to illustrate, if a firm has a policy of 50 per cent target payout ratios, its dividends. will between Rs 1 and zero per share on the assumption that the earnings per share are Rs 10 and zero respectively.